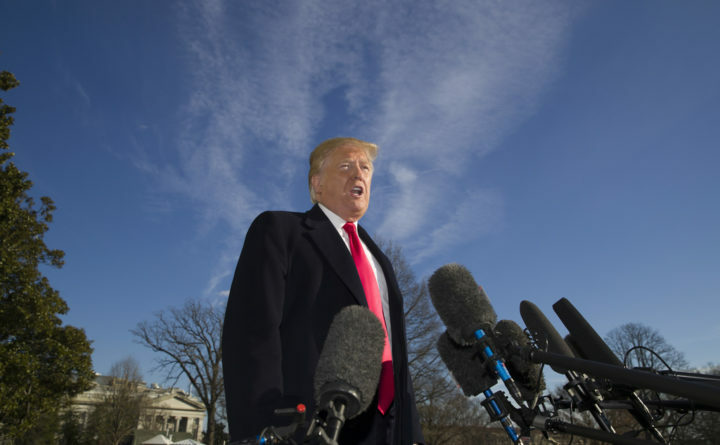 President Donald Trump will be speaking from the Oval Office tonight to make the case for $5.7 billion to start building a wall along the southern U.S. border – the crux of a funding impasse with Congress that has led to a partial government shutdown. We already have a pretty good sense of the claims he will make – as the president and his aides have been using them for weeks. Here’s a guide to 20 possible assertions the president will make tonight. –The situation along our southern border is a national crisis. –The wall will be paid for by the new U.S.-Mexico-Canada trade deal. This is a Four-Pinocchio (whopper-sized) claim. During the campaign, Trump more than 200 times promised Mexico would pay for the wall, which the administration says would cost at least $18 billion. Now he says the minor working of the North American Free Trade Agreement (NAFTA) will earn enough money for pay for the wall. This betrays a misunderstanding of economics. Countries do not “lose” money on trade deficits, so there is no money to earn; the size of a trade deficit or surplus can be determined by other factors besides trade. Congress must still appropriate the money, and the trade agreement has not been ratified. –I have already started building the wall. –The wall will be built by good old American steel companies that were practically out of business. Trump often hypes the impact of his steel tariffs on the steel business. Steel companies were not practically out of business. U.S. Steel has restarted some blast furnaces and its profits and revenue initially went up, but steel stocks have plunged in recent months as worldwide steel prices have fallen, led by a decline in steel prices in China. Barron’s reports that of the 13 stocks in the steel subindex of the Standard & Poor’s 1500 composite, all but one are down year to date by an average of nearly 25 percent. Moreover, even with the domestic steel mills running at 80 percent capacity, the United States needs to important 30 million tons of steel, Barron’s said. –I never said it would be a concrete wall. –The wall in Israel is 99.9 percent effective. Only one-tenth (33 miles) of the Israeli barrier with Palestinian territories is an eight-meter (25-foot) concrete wall. The other 90 percent is a two-meter (six-foot) high electronic fence. As for 99.9 percent, these numbers are a fantasy. The New York Times in 2016 reported on a vast smuggling industry that easily evades the Israeli security fence and wall that divides Israeli and Palestinian areas. –U.S. officials have blocked nearly 4,000 known or suspected terrorists from entering the country. DHS data show that most individuals on the terrorist watch list – a different statistic than encounters with known or suspected terrorists – attempt to enter by air. Most of the 2,554 people on the terrorist watch list who were encountered by U.S. officials in 2017 tried to enter through airports (2,170) or by sea (49). “Here is ground truth on this issue. Terrorist groups like al-Qa’ida and ISIS spend time talking about, brainstorming and even fantasizing about ways in which they can do harm to the United State. At times, those conversations have certainly included discussion of ways in which terrorist operatives might be inserted into the Homeland. But we also knew from intelligence reporting that terrorist groups have very high regard for our Homeland Security capabilities, including our border security. They know we had become a much “harder” target than at the time of 9/11 and that getting their operatives into the United States is an extremely challenging proposition. –There have been nearly 3,000 special-interest aliens who have been stopped at the border. –The number of terror-watchlisted encountered at the southern border has increased over the past two years. Without minimizing the potential threat, this claim should be taken with a heavy dose of salt, because it’s impossible to compare her numbers. Did it increase from three to five, or 100 to 150? There’s no indication whatsoever. As noted above, the State Department says there’s no credible information that terrorists have tried to enter through the southern border. Being on the terrorist watch list does not necessarily mean you’re a terrorist, as the late-Sen. Edward Kennedy, D-Mass., would attest. –In the past two years, ICE has arrested 235,000 aliens on criminal charges or convictions. “Inadmissibles refers to individuals encountered at ports of entry who are seeking lawful admission into the United States but are determined to be inadmissible, individuals presenting themselves to seek humanitarian protection under our laws, and individuals who withdraw an application for admission and return to their countries of origin within a short timeframe,” according to CBP. All of this is legal. Reports have suggested that some minors from Central America are coming to the U.S. border with adults who are not their parents. But the number of suspected cases of fraudulent parentage is fraction of the overall number of family units apprehended. The Washington Post reported, between April 19, when the trend was first suspected, and Sept. 30, the end of the 2018 fiscal year, CBP agents separated 170 families after determining that the child and adult traveling together were not related. That equals about a 0.25 percent of all family units apprehended. Plus, Customs and Border Protection reports just over 20,000 family units – not minors – were apprehended at the southern border in both November and December 2018. A family unit is defined by CPB as a minor apprehended with at least one family member. –The immigration court backlog is nearly 800,000 cases. There are 775,510 pending immigration cases in the United States as of November 2018, according to Syracuse University’s Transactional Records Access Clearinghouse (TRAC). That’s a record high and an increase from 735,739 in fiscal year 2018 and 594,959 in fiscal year 2019. The problem has been exacerbated in recent weeks because the government shutdown has closed the immigration courts. –There has been a 2,000 percent increase in asylum claims over the past five years, with the largest growth coming from Central America. If the president brings up asylum claims, it’s irrelevant to the question of a border wall. Anyone may arrive at any port of entry at the United States and request asylum, and then his or her case would be adjudicated. A border wall would not prevent people from requesting asylum. Any border wall would likely be built a few miles inland from the border, so anyone could approach the wall and be on U.S. territory, allowing them to legally make a request. This is an age-old Trumpian claim that has been debunked time and time again. During the 2016 campaign, he claimed illegal immigrants were bringing “tremendous” disease. But the World Health Organization found that, “in spite of the common perception of an association between migration and importation of infectious diseases, there is no systemic association.” Rather, there’s more risk of disease spreading from business travelers or tourists than migrants. This is partly just a numbers game – migrants at the southern border make up a small proportion of all the people entering the United States on a given day. Plus, anyone seeking asylum in the United States undergoes a medical screening and examination to identify inadmissible health conditions. They also are required to meet U.S. immunization requirements before they apply for permanent U.S. residence. In 2017, more than 15,000 people died from drug overdoses involving heroin in the United States, according to the Centers for Disease Control and Prevention. That works out to about 300 a week. During a contentious meeting with then-House Minority Leader Nancy Pelosi, D-Calif., and Senate Minority Leader Chuck Schumer, D-N.Y., on Dec. 11, the president argued for the wall by claiming that sectors with barriers have seen a big reduction in border apprehensions. “According to a congressional aide, there is about $10 billion left in unobligated funds for military construction in the current fiscal year’s defense budget, in addition to some $13 billion that has rolled over from previous years. The money, however, has been appropriated for specific projects. This aide, and another one, spoke on the condition of anonymity because they are not authorized to speak publicly about the issue.